* For a classic or vintage wedding look, Mariell's 3-row ivory pearl and silver rhodium antique bracelet with pave Cubic Zirconia is the perfect choice. * The stunning vintage CZ motif is finely crafted with intricate pave stones to look like a true heirloom! 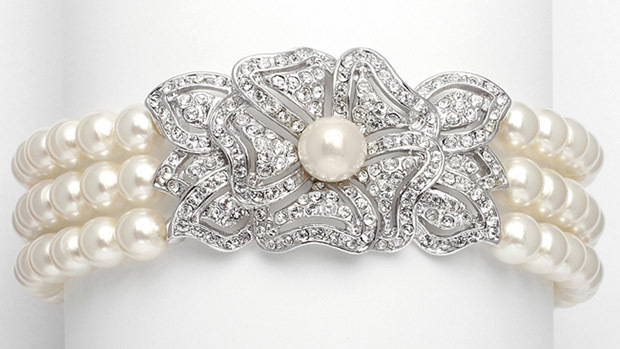 * Mariell's exquisite adjustable 7" - 9" wedding bracelet has 5mm ivory pearls with a stunning rhodium vintage Cubic Zirconia motif that is 1 1/2" w x 1" h.
* Our elegant 3-row bridal bracelet is also popular for bridesmaids or mothers of the bride. * It has gorgeous matching earrings (3826E) and an exquisite necklace (3826N) sold separately.